Since making its world debut in Detroit in January of this year, the new BMW M2 Coupe has caused an international stir; it has been in action on the racetrack as the BMW M2 MotoGP Safety Car since March. Now the high-performance coupe from BMW M will also play the main role in the BMW M Award; as the winner’s car for the winner of the 2016 season. As a long-standing partner of MotoGP organizer Dorna Sports, BMW M Division has presented the BMW M Award since 2003. At the end of every season, the rider with the best qualifying results is awarded an exclusive, customized BMW M car. BMW unveiled the 2016 winner’s car at the Spanish Grand Prix in Jerez la Frontera; the new BMW M2 Coupé in Long Beach Blue Metallic. In 2016, the BMW M Award will be presented for the 14th time. Just like the points system for the races, riders at each Grand Prix weekend are awarded points relative to their positions in qualifying. Pole position is rewarded with 25 points, second place on the grid earns 20 points and third place scores 16 points – right down to one point for 15th. The rider with the most points at the end of the season wins the BMW M Award. Marc Márquez, Valentino Rossi and Casey Stoner are the current record holders, each with three BMW M Awards to their name – with Márquez being the only rider who has won three times in a row. His Spanish compatriot Jorge Lorenzo has earned the coveted title of top qualifier twice so far. Sete Gibernau and Nicky Hayden have both won once. The BMW M Award is one of the many pillars of BMW M’s long-term commitment to the pinnacle of motorcycle racing. At the centre of the partnership with Dorna Sports is the provision of the BMW M fleet. 2016 is BMW M’s 18th season as “Official Car of MotoGP”. 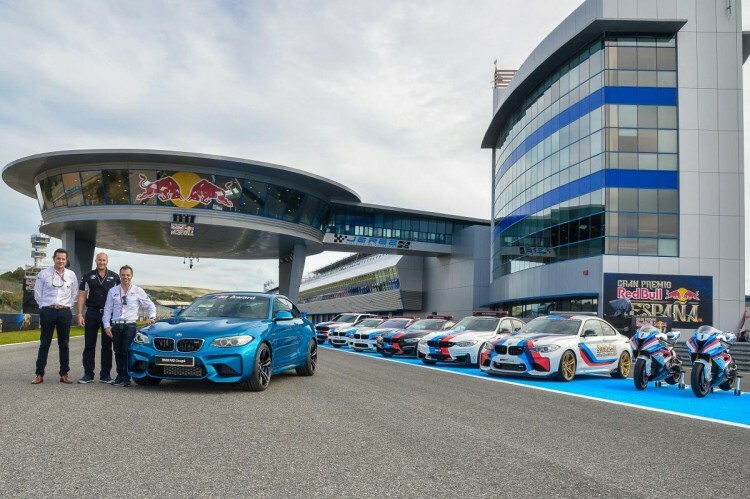 This year’s fleet of official MotoGP vehicles includes a total of six different BMW M and M Performance models. Alongside the new BMW M2 MotoGP Safety Car, the BMW M4 Coupé with water injection and the BMW M3 are also in action as safety cars. The BMW X5 M and the BMW M550d xDrive Touring take to the track as medical cars this season. BMW M Division provides the safety officer with a BMW M5. Two BMW S 1000 RRs, which BMW Motorrad provides as safety bikes, complete the 2016 safety car fleet.